For anyone who does not know by now, APEX 4.0 has been released. And if you have not yet downloaded and upgraded, I say, “What are you waiting for?!?!?!”. Click here NOW and download it. I’ll wait. *insert jeopardy music here*. Ok, done? Great! There are a ton of new features in this release. One of the most significant ones are Plug-Ins. In a nut shell, Plug-Ins give you, the APEX developer, to ability to extend the APEX development framework with custom item types, region types, and process and dynamic actions. I finally got around to playing with them and lets just say I am impressed. At first, the idea of writing Plug-Ins seems daunting, but after playing with them for an hour or so, it did not seem so hard. It’s easy to take the example supplied with the sample application and and use it as a outline to make your own. In fact, that is exactly what I did to make my first item Plug-In. I encourage you to do the same. You can also grab my Plug-In and see what I did as well. In prior APEX releases, if you wanted to include a jQuery plugin on your page, you would have had to embed all the code into the page itself. And there are many different places to include that code. Each developer does it a bit differently. I know myself, I was not very consistent going from page to page within the same application. This made for maintenance nightmares. Plug-Ins fix all of that. 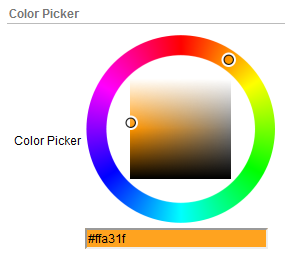 You can check out my color picker Plug-In and download and install it yourself. Recently I was developing an oracle database application and had the requirement to send out an email with an attachment. Initially it sounded pretty easy. I’ll just use the APEX_MAIL package and its all handled for me. But then I remembered, this was not an APEX application I was developing. So then I thought, no problem, I’ll just use the UTL_MAIL package. There is an API to add attachments. But wait, you can only add VARCHAR and RAW attachments and there is a max length of 32K on them. Not very useful if you want to send a multi-megabyte document as an attachment ( ie. a blob). So I had to drop down to an even lower API, UTL_SMTP and handle it all myself. Oh, and the attachment needed to be zipped as well (to save space in the tubes of our interwebs). I found the exercise interesting and thought I would share it with you. -- Compress if a content and not already zipped. Just a few things about the code. Line 15 – I use sys_guid() to generate a random 32 character string which I use as the boundary marker in the email message. You can use any character string you like. Lines 20 and 21 – You will need to change to your smtp server. with a leading space on boundary. I also did it on lines 42 and 68. Line 79 – No you can not do larger reads. Each line of the encoded attachment needs to be 57 bytes. In my example, I will only get at most 1 attachment because I pass in the asset_id and that is defined as the primary key. But if the query at line 48 was changed to possibly return more than a single row, the code would still work and we would have an email with multiple attachments. Although APEX treats the shuttle as a single element, it is in fact made up of many HTML elements, 10 images and 2 multiselect list boxes. With a little poking around the HTML of a generated APEX page with a shuttle item on it, I was able to determine that the actual DOM names of the multiselect list boxes of a shuttle were <strong>[SHUTTLE_NAME]_LEFT and <strong>[SHUTTLE_NAME]_RIGHT</strong>. How convenient. Accessing the actual elements was then trivial. I just used the APEX supplied function <strong>$x()</strong> function to get the elements. A good friend and colleague of mine at Oracle, Mark Greynolds, shared with me his work with WebLogic and APEX and getting them to work together. I thought it was something that everyone would be interested in and asked him if he would be willing to document the steps and allow me to post them here on my blog. He was and so here it is. 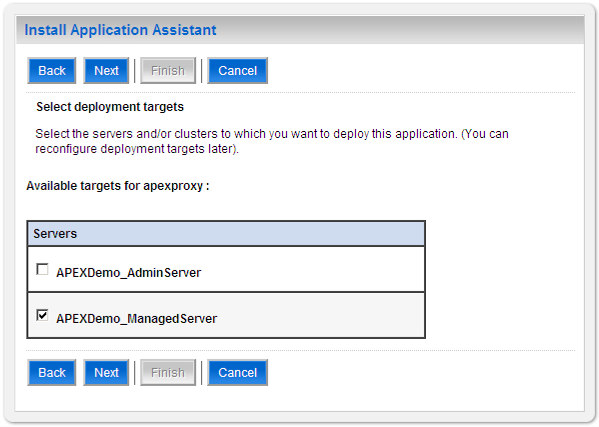 When a WebLogic Server (WLS) is the primary Web server, accessing APEX pages though the WLS requires a proxy. The configuration of APEX generally follows one of two configurations – Apache with mod_plsql or the Embedded PL/SQL gateway. When WebLogic (without Apache) is the main HTTP server, getting APEX to surface on the same port as WebLogic requires some form of proxy. This solution creates a very simple Web Application that invokes a Java Proxy Servlet when a user tries to access APEX pages. Wrapping this Web Application around the Java Proxy Servlet lets the WLS serve APEX without any port conflicts. The WLS Proxy Servlet is a fully documented out of the box tool. To create and deploy the Web Application simply build the files outlined in this document, deploy the application and then access APEX. For convenience, this solution takes advantage of the exploded deployment feature of the WSL. In addition to the ability to deploy jar, war and ear files, the WLS can deploy Web Applications as an exploded directory that contains the same contents of the archive file. An exploded archive directory contains the same files and directories as a jar archive. However, the files and directories reside directly in the file system instead of as a single archive file (JAR). This example uses the exploded deployment style to create the Web Application for this example. The default Web Application is what the server sends to browser clients who do not specify a recognized URI (or specify only “/” as the URI). Each server has only one default Web Application and for this solution to work, this application must be set as the default. If there is already a default, this servlet could be added to the existing application by using an exploded deployment of the default with modification to the web.xml to register the APEX proxy. 1. An Oracle database successfully serving APEX pages. The APEX instance may be on the same or different machine and served from either Apache or the Embedded PL/SQL gateway. In this example, APEX uses the Embedded PL/SQL Gateway of a database running on the same machine as the WebLogic server and natively appears at the http://localhost:8080/apex URL. 2. 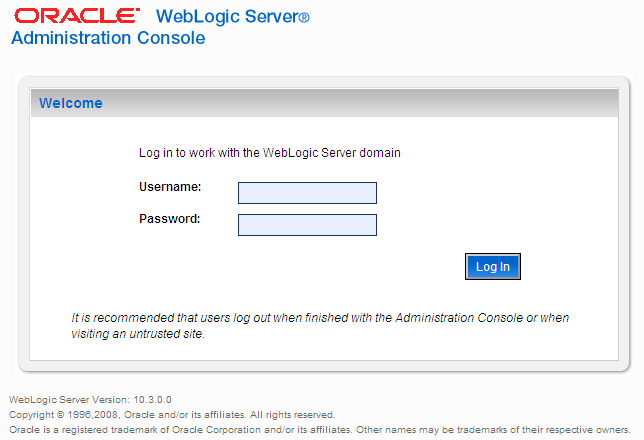 An Oracle WebLogic Server 10.3 running a Node Manger, the Administration Console and a Managed server. 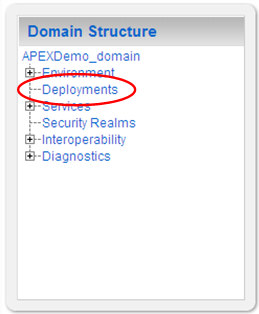 This example uses a domain created specifically for this exercise named APEXDemo. The WLS Administration console uses port 7001 and the Managed Server uses port 80. 3. There is no other “default” WebLogic application for the Managed Server. 1. Create the following directory structure somewhere on disk. This example assumes the C:\ drive is used. 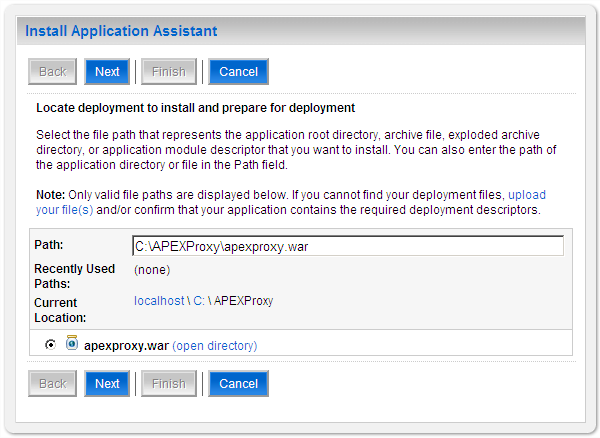 Note: the apexproxy.war directory name mimics the normal J2EE naming convention for Web Application archive (WAR). 2. In the apexproxy.war directory, create the index.html file. The WLS Managed Server renders this page when the server cannot map the browser’s URL to a valid destination. For this example, APEX becomes the default page due to a simple redirect to the full APEX path. 3. In the WEB-INF directory, create the web.xml file that defines this simple Web Application. <servlet-mapping> tags explicitly identify the two URL patterns used by APEX. 4. In the WEB-INF directory, also create the following weblogic.xml file. At deployment, WLS scans this file for the information on how to configure the deployment. makes this the default application for the Managed Server. 5. Begin the deployment by accessing the WLS Administration Console using the http://localhost:7001/console URL. 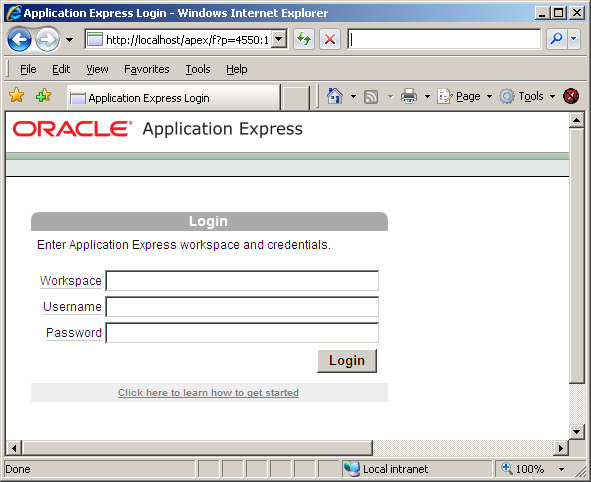 For this example, the Administration Console’s Username and Password are weblogic and weblogic. 6. On the left side navigation panel, click the Deployments link. returns an error and shows the directories in a navigable list. radio button for the WAR automatically completes the Path specification. 9. 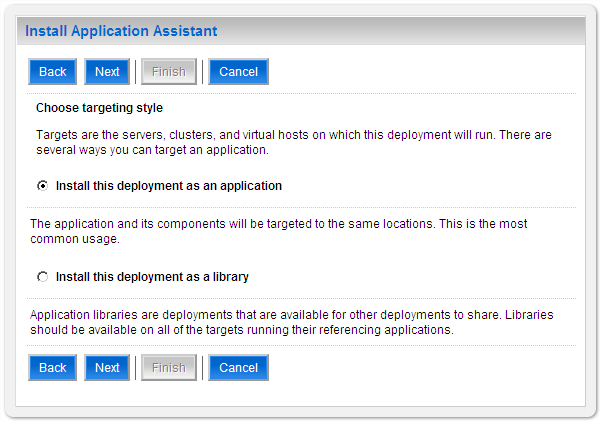 Click the Next button to accept installing the deployment as an application. 10. Select the desired server and click the Next button. application with the following messages. Lower down the page, the server display the status of the new application. 13. Enter the Managed Server URL in to a browser to see the APEX login page.